LinkedIn is preparing to launch Talent Insights, a self-serve product that provides talent professionals with direct access to data and analytics on talent pools and companies. When it becomes available in October, users will be able to tap into data and insights and better understand labor market trends, the competitive talent landscape and job seeker interests, all with an eye toward making more informed talent decisions. The company said that by using the product—powered, of course, by AI—users can access real-time insights on 560 million professionals, 20 million companies and 14 million job listings. All of this data is drawn from LinkedIn’s platform. “When it comes to using data to inform talent decisions, we know you are feeling the pressure to back up your recommendations and actions with data-driven insights,” wrote product team members Eric Owski and Kate Garvey in a LinkedIn blog post when the product was originally announced. 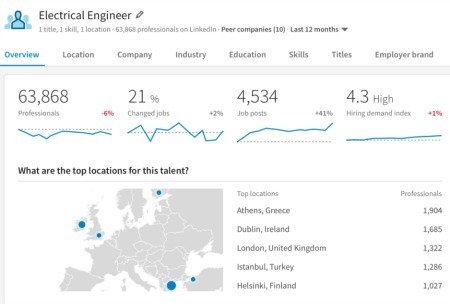 They said LinkedIn has fielded employer requests for data on topics such as the best emerging cities to hire engineers, skills migration and employer-brand comparisons. Arguing that “the next wave of recruiting lies in talent intelligence,” Owski and Garvey said using Talent Insights to directly access data on talent pools and companies will help recruiters and talent managers make decisions that are both more strategic and intelligent. When we saw Talent Insights demoed at UNLEASH America, we were struck by the strength of its design. For all the data-crunching going on under the hood, the product designers must have had self-service top-of-mind when they were at work. Visualizations are simple to understand and the interface relies heavily on LinkedIn Recruiter and the company’s other products. Collaboration features are built-in so team members can share insights and take advantage of “seamless” integration with LinkedIn Recruiter. The product’s main features are its Talent Pool and Company reports. The Talent Pool report helps users “precisely define and understand” specific types of candidates including information on where they live and work, what schools they come from, how in-demand they are and whether your company’s efforts to engage them through LinkedIn are succeeding. The Company report helps users understand talent at the company level they can determine whether they’re doing enough to attract and retain the people they want, and hone their employee branding and recruitment strategies accordingly, not to mention their approach to talent management. We think addition of Talent Insights is a smart move for LinkedIn on several fronts. First, it takes the concept of self-service seriously. The navigation stays true to the site’s look and feel so the process of forming queries and drilling into results will be familiar to a great many recruiters and other users. The bigger point of that is it removes data analysts and other specialists from many parts of the equation. Anyone familiar with LinkedIn and LinkedIn Recruiter will be able to sort through data from different angles—such region, industry, school or skill—as the need arises. In our view, a lack of tools with this level of usability has been one of the main reasons analytics use has been so slow to catch on in the world of HR. Survey after survey finds that business and HR leaders understand the value of analytics, but their enthusiasm has yet to be matched by their companies’ spending. LinkedIn says Talent Insights is the first step in its longer-term vision to incorporate more data-based insights into its talent products. It certainly fits nicely with the site’s How You Match feature, and if it encourages more recruiters to do their homework before reaching out to candidates, it could increase LinkedIn’s relevancy as a recruiting tool. If recruiters find it easy enough to use and leverage it sensible, fewer candidates may be inclined to abandon LinkedIn because of a perceived onslaught of recruiting spam.